Crystalline cellulose is an important constituent of the plant cell wall. However, its quantification at a cellular resolution is technically challenging. Here, we report the use of polarized light technology and root cross sections to obtain information of cell wall composition at a spatiotemporal resolution. Fridman, Y., Holland, N., Elbaum, R., Savaldi-Goldstein, S. High Resolution Quantification of Crystalline Cellulose Accumulation in Arabidopsis Roots to Monitor Tissue-specific Cell Wall Modifications. J. Vis. Exp. (111), e53707, doi:10.3791/53707 (2016). Plant cells are surrounded by a cell wall, the composition of which determines their final size and shape. The cell wall is composed of a complex matrix containing polysaccharides that include cellulose microfibrils that form both crystalline structures and cellulose chains of amorphous organization. The orientation of the cellulose fibers and their concentrations dictate the mechanical properties of the cell. Several methods are used to determine the levels of crystalline cellulose, each bringing both advantages and limitations. Some can distinguish the proportion of crystalline regions within the total cellulose. However, they are limited to whole-organ analyses that are deficient in spatiotemporal information. Others relying on live imaging, are limited by the use of imprecise dyes. Here, we report a sensitive polarized light-based system for specific quantification of relative light retardance, representing crystalline cellulose accumulation in cross sections of Arabidopsis thaliana roots. In this method, the cellular resolution and anatomical data are maintained, enabling direct comparisons between the different tissues composing the growing root. This approach opens a new analytical dimension, shedding light on the link between cell wall composition, cellular behavior and whole-organ growth. The plant cell wall is a dynamic structure. Growing cells are surrounded by a primary cell wall, the organization of which allows cells to expand. Cells that cease to grow deposit a more rigid secondary wall that enhances the mechanical support of the plant. Both cell walls are composed of cellulose microfibrils embedded in a matrix of polysaccharides of different structures (e.g., hemicellulose and pectin) that vary across the different developmental stage and tissues1,2. Cellulose is synthesized as chains of (1,4)-β-D-glucan that are tightly aligned to form the microfibril of a crystalline structure. Amorphous cellulose refers to the regions where the glucan chains are less ordered. The ratio between the crystalline and the amorphous domains is one parameter thought to affect the mechanical properties of the cell wall, by providing mechanical strength and viscoelastic characteristic, respectively3. Several methods have been developed to detect and quantify the two forms of cellulose arrangement, among them X-ray diffraction and cross polarization/magic angle spinning solid-state NMR4. X-ray diffraction can be used to determine the proportion of crystalline versus amorphous cellulose domains in the sample5. An alternative method uses fractionation of cell wall content into acid-insoluble and acid-soluble material, to distinguish between the crystalline and amorphous cellulose or other polymers, respectively. In this approach, incorporation of labeled glucose ([14C]Glucose) is used to quantify the cellulose6,7. These methods require large volumes of plant material for whole organ analyses, at best, and hence, are inadequately sensitive to tissue-specific variation in cell wall structure. Visualization of cellulose microfibrils at a cellular resolution can be achieved in live imaging studies combined with fluorescent dyes8,9, that can identify changes in the orientation of the cellulose microfibrils. However, these dyes are not used for quantification, they are not specific to crystalline cellulose and may interfere with the normal structure of the cell wall8. Polscope is an imaging technique that relies on the ability of crystalline cellulose to split light beams and retard part of the light10. Light retardation is strongest for microfibrils that lie perpendicularly to the direction of light propagation. For microfibrils with similar orientation, the higher the degree of crystallinity, the larger the light retardance11. Hence, polscope is used to study both the relative levels and orientation of the cellulose microfibrils. Roots exhibit linear growth, during which cells originating at the stem cell niche, at the tip of the root, undergo a series of cell divisions, before they rapidly expand12. The cells comprising the root expand in a unidirectional (anisotropic) manner, as dictated by small molecule signaling hormones that impact the properties of the cell wall13. Differential responses to hormones, in time and space, provide a means of ensuring balanced organ growth14. Hence, high resolution analysis of cell wall structure can provide important information necessary to better understand the connection between cell type-specific responses to whole organ growth. Here, we report the implementation of polscope to study tissue-specific accumulation of crystalline cellulose in Arabidopsis roots, as observed in high quality anatomical sections. This method recently uncovered cell type-specific accumulation of crystalline cellulose in response to spatial perturbation of hormonal activity15. Sterilize seeds (up to 30 mg) by wet or dry method. As an example, for dry sterilization method, add 1 ml glacial HCl 37% in 50 ml bleach, in a glass beaker in a closed desiccator for at least 4 hr and up to overnight. Perform this step in a chemical hood. Spread the sterile seeds on plates with 0.8% plant agar in 0.5x Murashige & Skoog (MS) medium. Wrap plates with Parafilm or porous tape and cover with aluminum foil. Store the plates at 4 °C for 1 - 4 days to promote uniform germination. Transfer the plates to a growth chamber suitable for growing Arabidopsis seedlings. Place the plates vertically to maintain root growth on top of the agar medium and to prevent penetration. Transfer seedlings to fixative 7 days after germination (DAG). Prepare 50 ml Richardson Solution by combining equal volumes of 1% Borax (buffer agent), 1% Methylene blue and 1% Azure (histological dyes) in double distilled water. Filter through a Syringe Driven 0.22 μm PVDF Filter Unit before use. Prepare 50 ml of fixative: 1.25% Glutaraldehyde in 0.05 M Sodium Cacodylate (buffering agent). Note: These materials are toxic and must be handled in a chemical hood. Add 100 µl of Richardson solution (see 2.1) to the fixation solution (see 2.2) to obtain the final fixation solution. Mark each well of a 6-well plate with the corresponding sample name. Place 2 - 3 ml final fixation solution (see 2.3) into the wells, so that the seedlings, once transferred, will be fully covered in liquid. Carefully transfer, using forceps, up to 10 seedlings to each well. Seal the plates using Parafilm. Store at 4 °C, in darkness, for at least one night, and up to one week. Dehydrate seedlings. Transfer them between wells of new 6-well plates, containing increasing concentrations of ethanol, as listed here: 10% ethanol for 15 min; 30% ethanol for 15 min; 50% ethanol for 15 min; 70% ethanol for 15 min; 85% ethanol for 15 min; 95% ethanol for 15 min; 95% ethanol at 4 °C, overnight, at minimum. Handle seedlings by carefully grasping them by their cotyledons, preferable with plastic forceps. Prepare infiltration medium. Mix the contents of 1 bag of the historesin kit activator with 50 ml Basic resin liquid kit in a small glass bottle. Stir with magnet for 20 min. Infiltration medium may be kept at 4 °C for a few weeks. Mark each well of a new 6-well plate with the corresponding sample name and fill with 2 - 3 ml of infiltration medium. Transfer the seedlings from the 95% ethanol solution to the infiltration medium using forceps. Make sure the seedlings are fully covered by the medium. Store at 4 °C for at least 4 days, to ensure maximum penetration into the plant tissues. Place small labels, pencil-marked with sample name, inside each well of embedding molds. Prepare embedding medium by adding 1 ml hardener to 15 ml infiltration medium (see 4.1). Do not attempt to prepare a volume smaller than 15 ml, to avoid polymerization issues. Fill half of each well in the mold with 200 µl embedding medium and cover with an overhead film piece cut to the mold shape, but to a size 1 mm larger on each side. Incubate at room temperature for at least 2 hr, to allow polymerization. Do not exceed 5 hr. Prepare an additional batch of embedding medium (see 5.2) and keep on ice, to avoid polymerization while root tips are being arranged in the mold. Cut each root tip under a dissecting scope using scalpel and very carefully position it: vertically for transverse sections or horizontally for longitudinal section, at about 2 - 3 mm from the mold periphery. Fill the mold completely with blocking solution and cover with an overhead film. Note that the blocking solution will shrink slightly once it is polymerized. Keep at room temperature for 2 hr, at minimum. To dry the blocks, place in a box with dry silica gel and leave at room temperature overnight, at minimum. Prepare glass knives from glass rods with a knife maker. Use the glass knives for tissue sectioning. Cut the glass rod into a square and then cut the square diagonally to produce two knives, using a diamond scoring tool. Section blocks into 2 - 3 µm width slices, using a sectioning machine. Place slices on a glass slide, on top of distilled water droplets and place the slide on a heat block set to low heat (50 - 60 °C), until water evaporates. Dilute Richardson solution (see 2.1) to 0.2% of the original solution and use 1 ml of it to cover the slices. Place on the heat block for 5 sec and then wash with distilled water. Dry the slide on a hot plate. Observe under a dissecting scope and mark the back of the slide with a marker, to indicate the position of the slices of interest, to facilitate their later identification under the microscope. Add 100 µl of mounting medium and cover with a cover slip. Place the covered slide containing the root sections under a light microscope equipped with Polscope system suitable to obtain retardance information and a polarizer/interference optic filter (Figure 1 A-D). Select magnification that allows clear visualization of the entire sample (e.g., 40X in this study) and focus the microscope on an empty field that contains block section but no root section. Try to find a clean region with no blemishes. Use this region to set the background. Set the imaging system and software parameters: Set range to 17 nm. Apply "Auto Exposure" and obtain background image from the empty field (see 8.2). One background image is used per experiment. Place a slide containing longitudinal sections under the microscope and obtain a retardance image of it. Focus the microscope on a root section of interest. Provide a new file name. Capture an abrio image (image with retardation information) through the "Live Abrio" window. Be sure to capture a section that includes the cell wall, which can be identified by the stained cellulose running along the periphery of the cell, as shown in Figure 2C. Double-click on the relevant image in the image stack. Select "Orientation Pseudo color" in the "Display Settings" tab. To estimate the cellulose microfibril angle, match the corresponding shade of the cell wall to that in the color wheel. NOTE: The color wheel in Figure 2C reflects the slow axis of light lying along the microfibril which indicates the direction along the long axis of the microfibrils. The angle of cellulose microfibrils is the angle indicated by the color and the long axis of the cell. For example, the elongating cell in the inset shows cyan color, tilted by about 90° to the long axis of the cells. To quantify the average microfibril angle in the cell wall, use "Retardance and Azimuth Stamp" tool from the toolbar of the software. While selecting the tool, point and click on the region of interest in the obtained image. NOTE: This will result in the display of the angles (azimuth) in degrees (Figure 2C). In an alternative open access polarized light image analysis software, lunch "Pol-Analyzer" plugin from the plugin menu. In the new opened window, select the "Birefringence" tab and open and then save the background file and the image file. In the image window, select "Specs." and adjust the 'ROI pixel size' (use 5 pixels for this study). In the "Specs." window, select "show values in Result table". Use the Polygon tool to mark the region of interest in the image window. Select "Orientation Lines" to obtain the orientation of the cellulose microfibril. NOTE: This will result in the display of the angles (azimuth) in degrees. NOTE: The average angle calculated by one of the two methods should be then normalized to the positioning of the root section along the slide. To correct for deviation from the horizontal positioning of the whole root section along the slide, quantify the average microfibril angle of the cell wall flanking the cell along its long axis (that is, perpendicular to the section and along the root growth axis, Figure 2C). This angle is 180° when the root section is accurately positioned along the slide. For calculating the microfibril angle, subtract the average measured microfibril angle of the flanking cell wall from 180°. Add the resulted difference to the average measured microfibril angle of the cell wall that lies flat on the slide. Use the transverse (cross) sections. Note that crystalline cellulose accumulation can only be compared between cells when their cellulose microfibrils are aligned at a similar angle (as determined in 9). Double-click on the relevant image in the image stack. Select "Pseudo color" in the "Display Settings" tab. To measure retardance. Zoom-in on the image. Select "Region" and mark all regions of interest. Move to the "measurements" tab and "Copy to Clipboard" all values. Transfer the data to Excel and extract required information (mean region of retardance). Normalize the data. NOTE: To account for differences in thickness between slices, express the values relative to a specific cell wall edge in the slide. To normalize, divide the average retardance corresponding to the cell wall of interest by the average retardance of a different cell wall in the same image. For example, the outer epidermal cell wall was normalized to the inner cortical cell wall in our study. Repeat measurements for at least 3 sections per root, with a minimum of 3 roots per sample. We study the impact of cell type-specific responses to brassinosteroids (BRs), using the Arabidopsis root as a model organ15-17. When the BR receptor BRI1 is targeted, in the background of bri1 mutant, to a subset of epidermal cells called non-hair cells (Figure 2A,B), it inhibits unidirectional cell expansion of neighboring cells, and whole-root growth15. Polscope analysis was performed to reveal the mechanism underlying this inhibition. Longitudinal sections of the root obtained from wild type and from lines expressing BRI1 in non-hair cells only, showed similar orientation of cellulose microfibrils (Figure 2C,D,and as explained in 9.2.3), enabling comparison of the relative accumulation of crystalline cellulose in meristematic and elongating cells, using cross sections taken from these zones (Figure 2E,F). This analysis showed a correlation between BRI1 expression in non-hair cells and local accumulation of crystalline cellulose. Follow up experiments showed that mild inhibition of cellulose synthase by low concentrations of isoxaben lowered the level of crystalline cellulose in these cells, which in turn, partially restored growth inhibition, by promoting unidirectional cell expansion and root length15. Figure 1: Polarized Light Microscopy System. 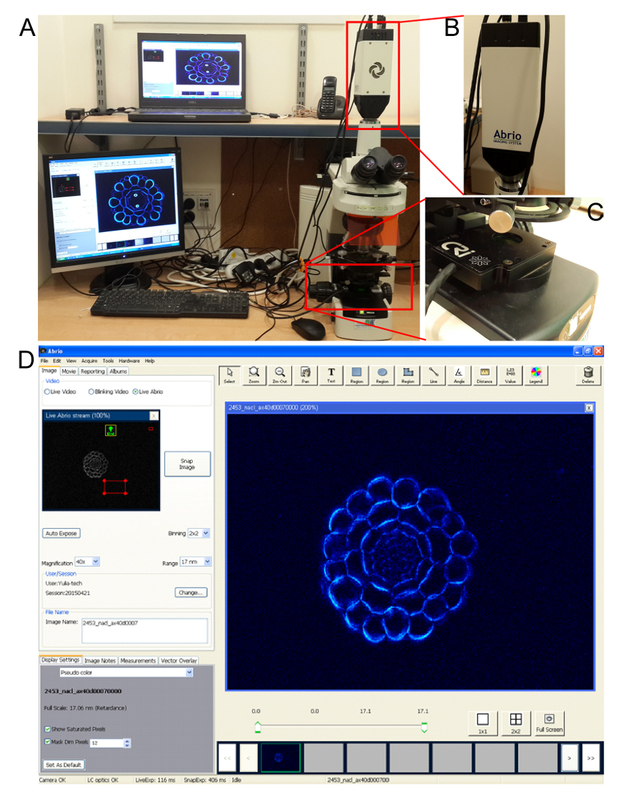 The Polscope system consists of a light microscope (A), equipped with a CCD digital camera (B), analyzer and a green liquid crystal located on top of its light source (C). (D) Abrio software was used for image acquisition and analysis. Please click here to view a larger version of this figure. Figure 2: Polscope Analysis of Cell-Wall Composition. (A) Cross-section of the Arabidopsis primary root showing radial organization of its constituent tissues. Of these, the epidermal non-hair cells (N); hair cells (H) and cortex (C) are marked. Bar, 10 µm. (B) Confocal microscopy images of roots expressing BRI1-GFP targeted to non-hair cells. White, PI staining that marks the cells, Green, BRI1-GFP expression. Bar, 20 µm. (C) Longitudinal sections of roots obtained from wild type and from plants expressing BRI1 in non-hair cells. The angle of cellulose microfibrils (i.e., the angle between the color and cell long axis, reflecting the long axis of the root) is similar between the two lines. The cell wall flanking the cell along its long axis is encircled; angle mark represent the shaded cell wall which is measured. Bar, 50 µm. (D) Quantification of cellulose microfibril angle in epidermal cell walls. Note the high variability of the angles present in meristematic cells (i.e., meristematic zone, MZ) as compared to cells in the transition zone (TZ), as reflected by the box plot. The similar average cellulose microfibril angle between wild type and plants expressing BRI1 in non-hair cells enables comparison of crystalline cellulose accumulation in cells of their corresponding developmental zone. The average angle in each sample is indicated by a red line. (E-F) Transverse root sections of these same plant backgrounds, shown in light retardance mode. Color scale represents light retardance of 0 - 17 nm. Sections corresponding to the meristem (E) and elongation (F) zones are shown. Bar, 50 µm. The outer epidermal cell wall and inner cortical cell wall are encircled. (G) Quantification of the retardance values as calculated from the polscope images. Values are expressed as the ratio of retardance between the outer epidermal cell wall and the inner cortical cell wall. Note that the high deposition of crystalline cellulose in non-hair cells in lines expressing BRI1 in these cells only. Mean +SE; 40 < n < 600; (**) P < 0.01; (***) P < 0.001 in a two-tailed t-test. The figure was adopted and modified from15. Please click here to view a larger version of this figure. Here, we present a method for determination of the accumulation of crystalline cellulose in the different tissues composing the Arabidopsis roots, while maintaining anatomical information. As such, it provides an additional step towards understanding growth processes in plants at a cellular resolution. This method can be also applied for the study of additional plant species and organs. A number of points must be considered when applying the method. First, crystalline cellulose accumulation in a given root section can be compared among tissues, among sections from different genotypes and among treatments if the orientation of their cellulose microfibrils is similar. Cellulose microfibrils orientation is determined in longitudinal section containing one face of the cell wall18. Hence, the series of longitudinal sections, covering the distinct tissues of the roots, from the outer to the inner most ones, enable analysis of the cellulose microfibrils orientation in the different tissues, at a given developmental stage. In the example shown here, the meristematic cells of the epidermis have a wide range of cellulose microfibrils orientations with an average cellulose microfibrils angle of 140°, while the elongating cells of the epidermis have a more organized structure, with an average cellulose microfibrils angle of 120°. These measurements were similar between wild type and the mutant of interest, thereby allowing a confident comparison of their relative crystalline cellulose accumulation, in the corresponding cell types and developmental zone. Secondly, variability in the width of the different sections can impact the levels of light retardance measured. This is circumvented here by normalizing the raw retardance measurements of the tissue of interest (epidermal cells) to the retardance measurement of a different tissue (cortex cells). The normalized values are then compared (See Figure 2E-G). Finally, transverse sections along the root, capture different developmental zones. Identification of these zones in the cross section is important for interpretation of the data. Loss of the outermost lateral root cap cell layer in the section comprise a straightforward zone marker. In general, cells start their fast expansion when the oldest cell of the lateral root cap undergoes programmed cell death, after which, the unprotected epidermis becomes the outermost tissue19. Currently, methods that provide a cellular resolution measure of the ratio of the crystalline versus the amorphous cellulose domains are lacking. Indeed, this is also one limitation of the method presented here. However, its ability to communicate the accumulation of crystalline cellulose per se is a significant advance, as high relative levels of crystalline cellulose likely renders a more robust cell wall with increased tensile strength. Development of high resolution tools to precisely determine the composition the cell wall alongside its mechanical properties remains a future challenge. We thank Dr. M. Rosenberg for her advice and help with anatomical sectioning. We also thank D. Eisler for his technical assistance. This research was supported by grants from FP7-PEOPLE-IRG-2008, Binational Agriculture research and Development (BARD; IS-4246-09), and Israel Science Foundation (ISF; 592/13). Cosgrove, D. J. Growth of the plant cell wall. Nat Rev Mol Cell Biol. 6, 850-861 (2005). Wolf, S., Hematy, K., Hofte, H. Growth control and cell wall signaling in plants. Annu Rev Plant Biol. 63, 381-407 (2012). Mazeau, K., Heux, L. Molecular Dynamics Simulations of Bulk Native Crystalline and Amorphous Structures of Cellulose. J. Phys. Chem. B. 107, 2394-2403 (2003). Zhao, H., et al. Studying cellulose fiber structure by SEM, XRD, NMR and acid hydrolysis. Carbohydr Polym. 68, 235-241 (2007). Fujita, M., et al. Cortical microtubules optimize cell-wall crystallinity to drive unidirectional growth in Arabidopsis. Plant J. 66, 915-928 (2011). Peng, F., et al. Fractional separation and structural features of hemicelluloses from sweet sorghum leaves. Bioresources. 7, (2012). Xu, S. L., Rahman, A., Baskin, T. I., Kieber, J. J. Two leucine-rich repeat receptor kinases mediate signaling, linking cell wall biosynthesis and ACC synthase in Arabidopsis. Plant Cell. 20, 3065-3079 (2008). Anderson, C. T., Carroll, A., Akhmetova, L., Somerville, C. Real-Time Imaging of Cellulose Reorientation during Cell Wall Expansion in Arabidopsis Roots. Plant Physiol. 152, 787-796 (2010). Baskin, T. I., Beemster, G. T., Judy-March, J. E., Marga, F. Disorganization of cortical microtubules stimulates tangential expansion and reduces the uniformity of cellulose microfibril alignment among cells in the root of Arabidopsis. Plant Physiol. 135, 2279-2290 (2004). Iyer, K. R. K., Neelakantan, P., Radhakrishnan, T. Birefringence of native cellulosic fibers. I. Untreated cotton and ramie. J. Polym. Sci. A-2: Polymer Physics. 6, 1747-1758 (1968). Abraham, Y., Elbaum, R. Quantification of microfibril angle in secondary cell walls at subcellular resolution by means of polarized light microscopy. New Phytol. 197, 1012-1019 (2013). Petricka, J. J., Winter, C. M., Benfey, P. N. Control of Arabidopsis root development. Annu Rev Plant Biol. 63, 563-590 (2012). Vanstraelen, M., Benkova, E. Hormonal Interactions in the Regulation of Plant Development. Annu Rev Cell Dev Biol. (2012). Singh, A. P., Savaldi-Goldstein, S. Growth control: brassinosteroid activity gets context. J Exp Bot. 66, 1123-1132 (2015). Fridman, Y., et al. Root growth is modulated by differential hormonal sensitivity in neighboring cells. Genes Dev. 28, 912-920 (2014). Vragovic, K., et al. Translatome analyses capture of opposing tissue-specific brassinosteroid signals orchestrating root meristem differentiation. Proc Natl Acad Sci U S A. 112, 923-928 (2015). Hacham, Y., et al. 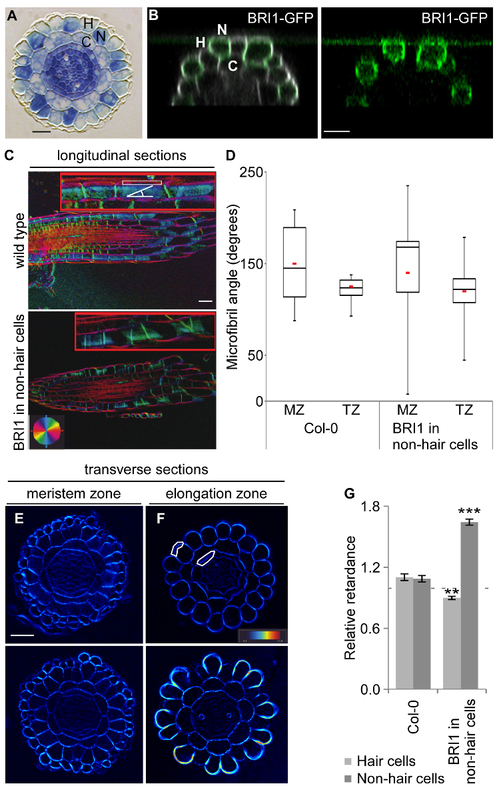 Brassinosteroid perception in the epidermis controls root meristem size. Development. 138, 839-848 (2011). Gu, Y., et al. Identification of a cellulose synthase-associated protein required for cellulose biosynthesis. Proc Natl Acad Sci U S A. 107, 12866-12871 (2010). Fendrych, M., et al. Programmed cell death controlled by ANAC033/SOMBRERO determines root cap organ size in Arabidopsis. Curr Biol. 24, 931-940 (2014).